This delightful, character-building tale tells the story of a horse who succeeds, not because he is necessarily better than the others, but because he believes in himself. Little Freddie is a foal who dreams to run in the Kentucky Derby and receive a blanket of red roses when he wins the race. Although accomplishing his goal will take hard work and hours of training, he discovers that his fierce determination will guide him to the finish line. Little Freddie learns lessons in trust, respect, and humility as he travels from stable to stable and race to race. Leaving his mother and friends to pursue his goal of being the greatest racehorse ever, Little Freddie becomes more disciplined and builds his confidence. His story carries the message that courage makes any dream within reach. 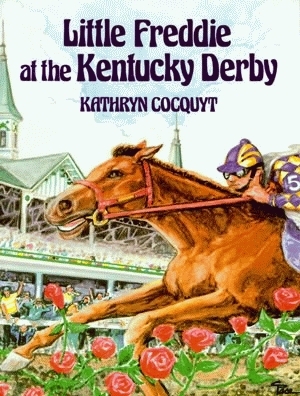 Kathryn Cocquyt began breeding Thoroughbred horses in 1986, with the birth of Rue Royale. A writer and freelance journalist, she continues to work with race and show horses. She enjoys riding and competing hunters at Fieldstone Riding Club in Moorpark, California. Also the author of Pelican’s Little Freddie’s Legacy, she resides in Simi Valley, California. Jacket illustration painted by Chip Pace.